As you probably know, the Westmoreland Heritage Trail currently starts in Export (east of Monroeville), from which you can connect to the West Penn Trail (in Saltsburg) and the Ghost Town Trail (in Blacklick). Recent funding successes mean we have achieved our target goal of $1,064,000 for acquisition, planning, preliminary engineering and design of the 9.5-mile TCRR [Turtle Creek Railroad] corridor. A Transportation Alternatives Program grant application (TAP2014) was submitted on April 4, 2014, requesting $1,850,000 for construction of 3.8 miles of the Turtle Creek Rail Trail, with construction proposed to commence in 2016. The TAP is a federally funded program administered thru PennDOT and Southwest Pennsylvania Commission. This is awesome. It gets so close to connecting to the GAP. If they could do that, imagine the network of trails you could access! After this is done, you can start from downtown, you could take the gap to mckeesport, ride roads to trafford, take Westmoreland Heritage Trail to saltsburg then to blairsville, ride roads to join up with the ghost town trail and go all the way to ebensburg or take the hoodlebug trail to indiana, pa. In 1993, I had hoped the TCIRR would be re-purposed into a Light Rail extension, and said so publicly. At one point, I suggested running the T out to Delmont. I don’t remember the last time I knew a train ran on that line — at best it was one a week, five cars long, maybe 1987? — and when I crossed over the tracks in Trafford last summer, there were large sumac bushes growing up through the rails. If ten feet of rail ever get laid outward from town beyond Morewood Avenue, I would be highly surprised. Hell, if ten feet of rail ever get laid east of Dinwiddie Street, I would be highly surprised. Sure, I’ll take a rail trail. Gotta agree with Stu on this one. T Stops out to Delmont would be awesome and hopefully take pressure off the Parkway. The rail trail would be nice too, especially if Duck Hollow were to be expanded in the process. The best way to take pressure off the Parkway East is to build lots of nice, not-ghetto-won’t-ever-be-ghetto high-density housing west of the Squirrel Hill Tunnels, and put a crapton of desirable public transit between there, Oakland, and downtown, with safe, desirable bike connections to those points, as well. Turtle Creek industrial RR discontinued service after flooding a few years back. Federal regs require they can demonstrate absence of service for two years before they can formally abandon line. So, line was in use well into 2000’s it seems. A few weeks ago Yale & I were in Braddock and went exploring. We went East through town then past the mill. Just after the mill there is a road (2183) that takes you under the expressway and takes you right to several sets of RR tracks. We followed the tracks almost to Wall. There is a service road along all of this that is multi-lanes wide that could be made into a rail-trail with very little effort (basically a fence and some smoothing). This would make a great connection to the Turtle Creek Trail, and via Braddock to the GAP. Here’s a broad-brush map of where the major bike trails are now (solid lines) and where they could be in 10 years (dashed lines). Turtle Creek Rail Trail is orange, dashed. I currently drop in via Linden as the last time I tried to go under the viaduct, I ended up on the service road described earlier. ^sorry, it looks like 2183 is now a private road with a locked gate- i.e. not passable. I was down there several days ago trying to see if there’s a way through under the TBE. If you head southwest from Braddock Ave (through the parking lots of the YWCA / SMS Millcraft) you come eventually to an underpass that is blocked by a gate and a No Trespassing sign, and warnings of dangerous conditions ahead. I think it’s labeled US Steel. Looking at the map, though, I think that if you were to go around the gate and down that road you’d end up connecting to Braddock Ave again on 2183, assuming you weren’t stopped and didn’t succumb to whatever danger lurks there. OTOH the TBE is actually not that bad at that point — nice and wide and very little traffic. It’s a great example of Pittsburgh’s intermittently overbuilt infrastructure left over from the past. Don’t forget about the rough diamond trail video, which is kind of a vision of what we could have if the trails get connected. Also, http://www.transalleghenytrails.com/ website which shows many of the separate trail systems in western pa.
Yeah! I was thinking of that video but was too damn apathetic to dig it up. Yeah! That’s the Braddock Ave end of 2183. So, I’m not sure what’s going on there, but for right now the gate is open and it’s smooth sailing. At the October meeting of the Steel Valley Trail Council (SVTC) we’ll be hearing briefly about the Turtle Creek Rail Trail from Jeffrey Richards of Westmoreland County. You’re welcome to attend the meeting. I’ve been through there when the fence is open. 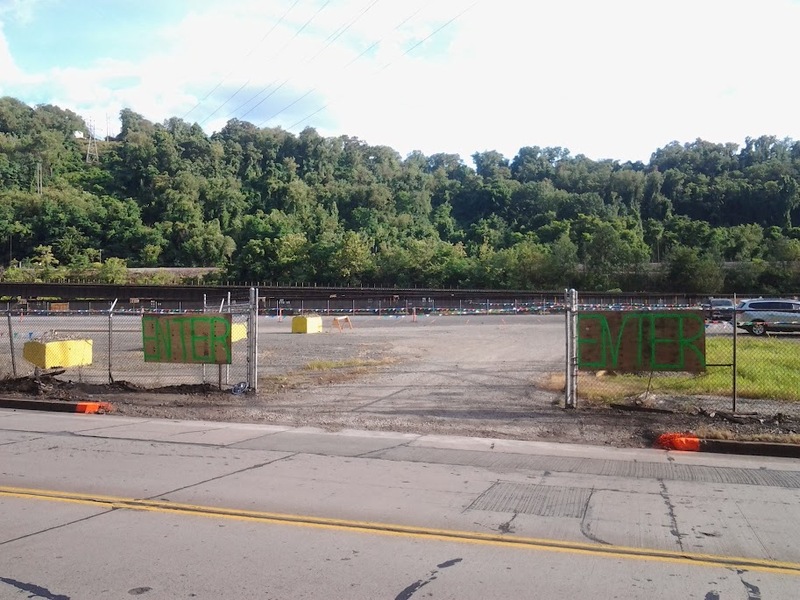 From Jon’s image, that actually looks like it is on the East Pittsburgh end of the map. You’re not likely to get stuck on that side, since it’s a huge parking lot with lots of people. Only danger is cars and 18-wheelers. On the other side, there’s a fence, which you can see on Google Maps. FWIW, there was a new rough diamond trail project video released, the beginning shows some parts of braddock and the turtle creek area and gives an overview of the whole rough plan along with a list of trail organizations who have been building the trails for years. re Rough Diamond video: awesome production values. I assume that a lot (if not all) of the labor was donated. This is great! Whoa. You can get on (and off) the Carrie hot metal bridge and not get arrested? Now *that* is so totally worth knowing. The tracks have now been removed from B-Y Park in Trafford to Lincoln Avenue in Export (most of the corridor). Besides for a section near the FTMSA sewage plant, the trail, although it is unimproved, is open, on a “at your own risk” basis. A hybrid or mountain bike should probably be used; the trail is overgrown/puddled/bumpy in some areas, especially in the eastern part. Most of the bridges have a deck composed of sometimes-rotted wooden ties (see this) — be careful on those! See this for some recent info. Considering taking a stroll down the trail with my bike later today. Any help with how to find the trail from trafford? Also, the ride at your own risk thing – is it actually “legal” to ride, or should I be pretty descrete. One way to find the trail is from B-Y Park (here). If you go thru 7th Street entrance to the lake and all the way to the other end, you will see the rail trail perpendicular to the park – it is cinder with a bit of asphalt ballast, and it continues to the left and right. Getting to the park on streets from 5th and Brinton streets is quite hilly, though. Another way is to start at the tracks by the Trafford Veterans Memorial Bridge and head north with them (see map here). This way is flat, and much less roundabout than the first way, but I don’t know if it is “legal” or not (the trail is planned to eventually run there, but it may still be owned by private the railroads (seeing that the track has not been removed on this part). All the trail from B-Y Park until at least west to the CAT plant near Export has signs posted by the county which say that this is the future Turtle Creek extension of the Westmoreland Heritage Trail, it may be used on an “at your own risk” basis, but no motor vehicles etc. allowed. So it is “legal” to ride on. Also, in this month’s recent Murrysville Trail newsletter, it says the trail will be walkable long before it is made into a proper trail. And there is a section, which starts from the sewage plant on the west, which is closed and has a “Trail Closed – No Trespassing” sign (you’ll know you’re there if you see a small clearing, probably with a bunch of work vehicles in it) , but it is possible to detour there by taking the little road on the right to Meadowbrook Road, and continuing on the trail by the next road crossing. Also, there is a connection for the 1-2 mile Funk Bikeway of Duff Park. This bikeway is somewhat narrow, and heading west has some drainage issues, but heading east it is a good alternative to the rail trail, and you can get on the road by the next road crossing easily. Before they removed the rails, I walked the trail in the Fall and cross country skied it in the Winter. It’s nice! You might run into some fishermen. Thanks everyone! I’ll let you know how it goes. I’m in Irwin, and I truly wish the old street car right-of-way from Irwin to Trafford would be turned into something similar. A few years back, I approached Allehgney Energy and they were willing to allow a trail on this ROW where they have power lines. We weren’t well organized, and had some terrible experiences with adjacent land owners while exploring the idea. After a threatening phone call, I gave up thinking that a short trail wasn’t worth the fight. Now that this could actually go somewhere, it may be worth exploring again. For the thousands of times I drove 993 between Irwin and Trafford, I never knew there was an interurban line along there. But since I now ride an old interurban line daily, I pay more attention than I used to to the subject. Had a fun ride last night. The trees are still down; however there is a path around through the woods. Past the water treatment facility, it is unridable mud. They used machines to grade it, and it’s like quicksand. Had to turn around at that point. Also, it’s amazing to me that there are two old trucks rotting away in turtle creek! I biked the future Turtle Creek Rail Trail yesterday, from Trafford Rd & Meadowbrook Rd (or Mills St) in Murrysville downstream to Forbes Rd in Trafford. In Google Maps, it’s marked as a rail line, but those RR tracks were removed in the past year. 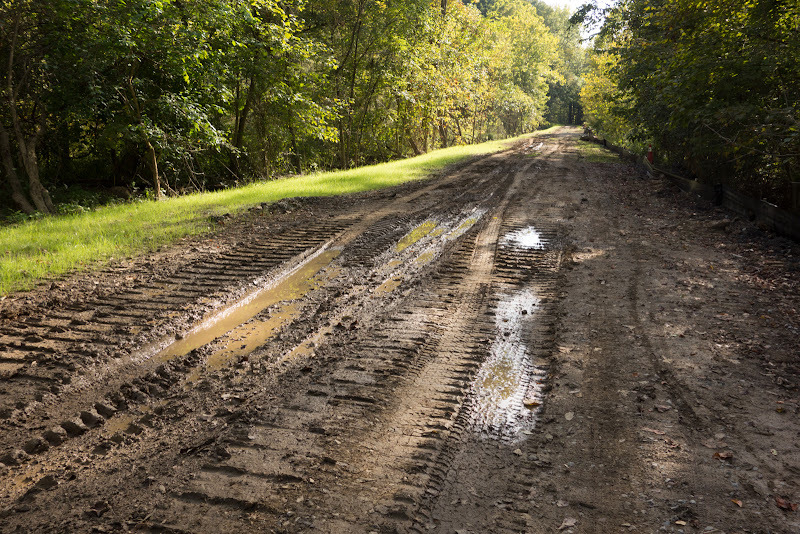 Of this five mile route, the first half of it was quite muddy, even though we haven’t had much rain in the past month, filling the fenders of my touring bike (38mm tires) with so much caked mud that I had to remove the front wheel and scrape out the fender. This first half is also marked closed, with No Trespassing signs, probably because of the heavy equipment being used to regrade it. But the southern half (north-end access from Meadowbrook Rd near Franklin Township Municipal Sanitary Authority or Saunders Station Rd) is officially open to cyclists and hikers. Its surface is a mix of small ballast (rocks 1 inch in diameter or less) and dirt, and would be fine for mountain bikers and passable for cyclists with tires of 30mm or more, I’d say. On my bike I was averaging about 7mph on this surface. 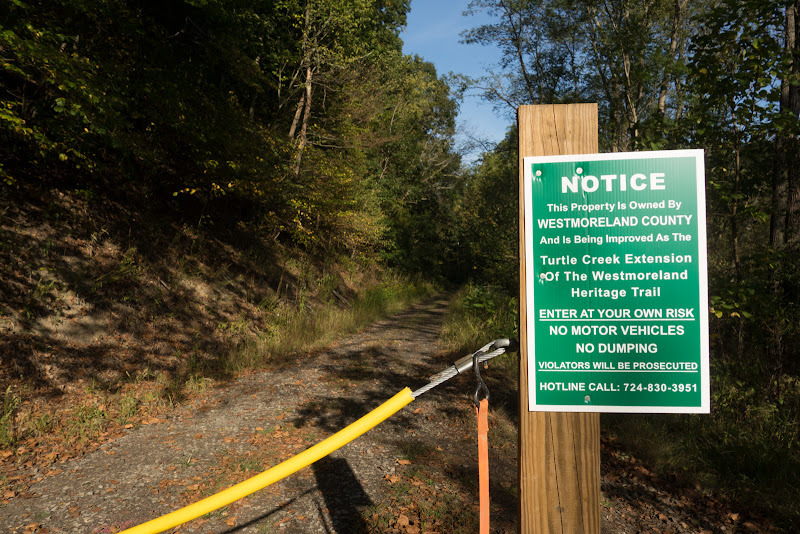 When Westmoreland County resurfaces with crushed limestone (scheduled to start in 2016? ), this should be a very nice trail for everybody. I’ve been using this trail to walk a friend’s dog once a week or so. It’s really nice. We’ve walked from BY Park west/south to the Trafford Bridge, but I prefer heading east/north from the Park. After crossing Forbes Road, you pass two small businesses that’ve never been open when I was using the trail. The next mile or so is really nice. That is all we have explored so far. We have not made it to what appears on maps must be a bridge. We have not made it to the sanitary plant. We usually turn around somewhere near the MP 2 marker. On most outings we see no one. On a couple of occasions we have seen one other person. Never more than that, if you don’t count the mechanic who always seems to be tinkering on a piece of heavy equipment at the second business you come to. From one direction, BY Park is posted as “no pets” but not from the main entrance. IF I expect the park to be busy (with like 15 people instead of the usual 5) I will try to park off off Forbes Road, near the ice cream stand. I need to figure out how to access the trail from Saunders Station. I can SEE the route from the park there, but I can’t figure out how to get there. What: Celebrate the recent acquisition of the Turtle Creek Industrial RR to extend the Westmoreland Heritage Trail! When: Thursday, December 10, 2015, 7:00 p.m. The Westmoreland Heritage Trail Chapter of the RTC is hosting an informal event to celebrate the acquisition of 9.2 miles of the Turtle Creek Industrial Railroad Corridor to add additional recreational trail for walkers, runners and cyclists, and connecting the communities of Export, Murrysville, Monroeville, Penn Township, and Trafford. Learn about the future work plans needed to complete the trail and meet fellow trail enthusiasts! For more information, please call Tom Dittman at 724-733-3661. The Westmoreland Heritage Trail Chapter meets on the second Thursday of each month. If you are interested in becoming a member or a volunteer, please contact chapter president Noel Grimm at 412-372-5429. Reminder, the celebration is tonight (Thursday, December 10, 2015, 7:00 p.m.). See above. Turtle Creek Rail Trail will probably start putting down crushed limestone between Monroeville and Trafford in 2017 (not 2016 as earlier estimated). The URA wants to refurbish the Rankin Hot Metal Bridge (RHMB, the abandoned railroad bridge just downstream of the Rankin Bridge) for car & truck access to the Carrie Furnace area as a second access road. The first is the Kenmawr Ave access ramp that was just built and which appears poised to open soon. The RHMB will be a future bike/ped connection. But it’s going to be expensive, so it’ll take years. David Conrad, who created the Rough Diamond Route videos that you may have seen, was at the event, and we discussed future bike trail routes from Trafford to Braddock. Sara Walfoort, who does rail freight coordination for the Southwestern Pennsylvania Commission (SPC), was there. Regarding Allegheny Valley Railroad (AVR), CSX, and Norfolk Southern (NS), she says all railroads are regulated by the Federal Railroad Administration (FRA), which does track inspections and will sometimes tell railroads to improve the safety of crossings, e.g. the Amity St crossing of NS in Homestead where several people have recently died. FRA may have prodded AVR to tighten up on the Panther Hollow crossing. Around PA, continuing decline of the coal industry could mean that other rail lines will close down in coming years, creating more potential rail trails. More news: Funding arrives for Westmoreland Heritage Trail between Trafford and Murrysville.